The first fifth generation fighter jet designed and built in Russia, not the Soviet Union, took flight six years ago, on January 29, 2010. This was the PAK FA which, after repeated postponements, is set to soon go into service with Russian Aerospace Forces. 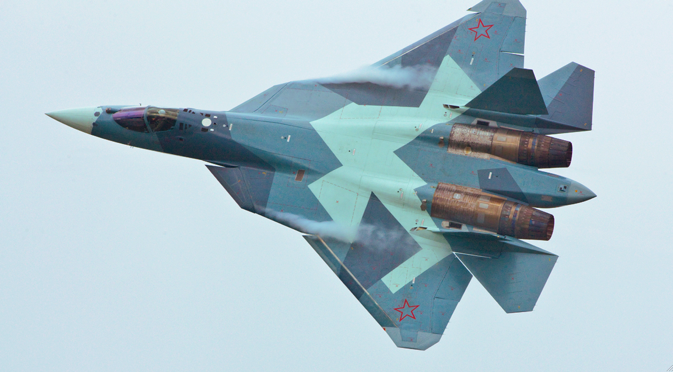 We look at how the PAK FA program is developing. The PAK FA project has been one of the main drivers in the recovery of Russian defence capacities. Modern production facilities were constructed and R&D work carried out, reviving the Russian aviation construction school. The project was based on established technologies used in another project, Russia’s first fifth-generation fighter; the MiG 1.44, and on the technology demonstrator the Su-47. The PAK FA got its engine from the MiG project, and the technology for manufacturing of composite parts from the Su project. Many components of the new fighter were built while modernizing the Su-27, which approached fifth generation capabilities in its latest versions – the Su-30SM and Su-35S. Russian Aerospace Forces have yet to receive one such jet fighter, despite 14 years having passed since its inception. The PAK FA project today consists of five flying prototypes and three copies, used for ground testing. Three additional aircraft are currently under construction. The testing work is close to completion, Yuri Borisov, Deputy Defence Minister, said in December last year. Modernized Soviet “air-air” medium and long-range missiles (modernized Soviet R-73 (RVV-MD) and R-37 (RVV-BD)), built for the PAK FA as well as for the fourth-generation fighters, should have gone into mass production by the end of 2015. No one knows if this has happened as planned. Optimized for the PAK FA, the anti-radar KH-58USHK missile, which was designed on the base of the Kh-58 missile that entered service in 1978, is also still being tested. New types of aircraft ammunition of the Grom (Thunder) project, designed specifically for the PAK FA, will be delivered to the armed forces no earlier than 2017. When will it go into service? Given the current problems, the Ministry of Defence has decided to reduce its purchase of the PAK FA, and opt for the cheaper and proven in production SU-35S. “Yes, we are reducing our purchases of the PAK FA fighter, and in the coming years, we will buy only one squadron,” Borisov said in July 2015. It appears that either the economic situation, or the modest pace of development of the PAK FA programme, or a combination of both, has forced the Defence Ministry to reconsider its plans. Nothing has changed since the end of 2015 and, before the New Year, a contract was signed to buy 50 additional Su-35S. That the programme has been delayed and facing difficulties that directly arose in 2015, is reflected in the postponement of the adoption of this aircraft into service. In May 2015, Bondarev said and in summer of 2015, Borisov confirmed that the aircraft would begin entry into the armed forces in 2016. In December 2015, Bondarev said the delivery of the PAK FA to the armed forces would begin only in 2017. The refusal by the Ministry of Defence to buy large batches of PAK FA, before the aircraft is fully ready, is understandable, especially since the Russian military has had previous experience of operating Mi-28N helicopters without on-board radar and the Ka-52 helicopters without anti-tank Vikhr (Whirlwind) missiles. These problems were resolved, but the repetition of a similar situation with a much more expensive aircraft would not be rational, in the overall preparedness of the Aerospace Forces. A small initial batch will allow military pilots to develop warfare and operational tactics by the year 2020, when the aircraft will get its new weapons, full-fledged radar, and most importantly, “engines of the second stage”. The latter will provide the PAK FA one of the key features of a fifth generation fighter; supersonic flight without the use of afterburners.